Humans have apparently domesticated so many animals that we can barely keep track of our activity. A lot of work has gone into trying to uncover the origins of domesticated cats and dogs, and while there’s sometimes contention over new discoveries, we seem to be honing in on how these animals came to live with us. The histories of a few other animals have a bit more room for improvement, as some commonly accepted explanations for how they were domesticated have recently been discovered to just be wrong. In the case of rabbits, researchers are essentially abandoning the notion of a single date for domestication, while horses have recently been found to be entirely domesticated, meaning that truly wild horses have been extinct for ages. Rabbits were supposedly domesticated in 600 AD, when Pope Gregory endorsed raising them so their fetuses could be eaten as a meat substitute during lent. Not only do we lack evidence that such decree was ever issued, but genetic analysis has found that people were probably raising rabbits well before that date. Once the original timing had been disproved, researchers realized that the notion of a single moment of domestication didn’t hold much water either. They said it’s more likely that rabbits were first rounded up as far back as ancient Rome, and then diverged genetically over a long time in their human-imposed isolation. The domestication was a just a gradual byproduct of other needs being met. Rounding up wild horses was possibly a more deliberate act. When the Botai people of Kazakhstan started rounding up and keeping horses 5,500 years ago, they initiated a change in the horses and their own lifestyles. Archaeological evidence of skulls, fencing, horse-skin leather and an unusual concentration of compounds found in manure suggests that the Botai people gave up being nomads around this time in order to raise horses in permanent settlements. The horses were probably ridden, but also used as a source of meat and milk, not unlike the dietary traditions of some Mongolian tribes today. The Botai were quite successful with their horses, and it’s now thought that some escaped and began spreading across Asia and into Europe. 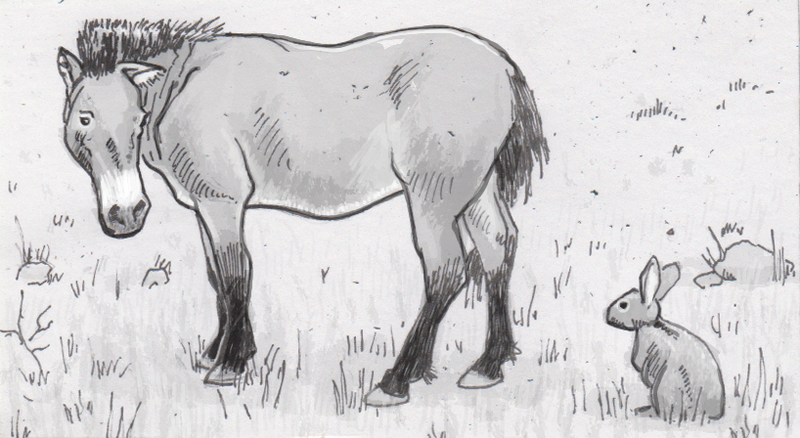 In fact, genetic analysis of living and extinct horses has found that all horses alive today stem from the domesticated Botai horses, including Przewalski’s horse, a sub-species previously thought to be the last wild horse on Earth. Like the mustangs of North America, Przewalski’s horses are actually domesticated horses that have been allowed to become feral. Since their genes have, at some point in history, been manipulated by human intervention, we’re basically left with no horses created strictly by natural selection. It’s understandable that these mistakes were made. Przewalski’s horse in particular is known for their upright manes, dun-colored coats and other features that resemble extinct wild horses, as well as the wild horses recorded in cave paintings by Neanderthals in France and Spain. Unfortunately, since humans weren’t really aware of how far domesticated horses had spread, it’s hard to say at this point when the last wild horse went extinct. There’s still a lot of biodiversity in domesticated horse populations, but it seems like it would be helpful for humans to fully understand our influences on the world around us.